If you can’t stand shopping centres cranking up Christmas carols and decking their halls with bounds of tacky dollar store decals, you’ll be safe, sound and sleighing with this bucket list. New menu, same me(ringue waffles). Vic Park is turning up the heat with a sublime new spring/summer brekkie menu. Win your morning (and friends) by landing the Asian duck salad with fried egg, toasted rice, peanuts, and Korean chilli sauce. She’s anything but basic, honey. On a scale of Biggie to Smalls, this newbie is a notoriously big deal. Setting up camp in Fish Lane, Next Episode is set to become a blended barbershop with a hip-hop inspired bar out back. In classic speakeasy fashion, you’ll have to ring a phone by the bar to get let in. Once you’ve made it to the top, a plethora of cocktails, rotating craft beers, DJs and rap-scene references will be waiting to greet you. Welcome to the gangster’s paradise. Shipping containers turned social hub have set sail for your social season needs. 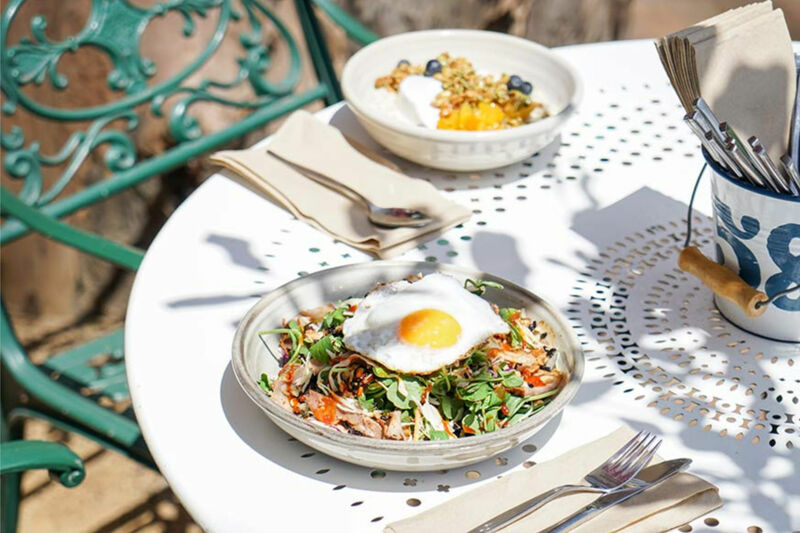 The Garden Pantry has planted its roots at West Village, West End, bringing the likes of Mr. Bunz, Cheeky Poke Bar and Salt Meats Cheese together to create a contemporary dining hall serving al fresco dining realness. Think of it as a food court, but with a design that’s worthy of a spread in Vogue. Lush, and delish. King Street’s newest addition is pretty pourfect. Atelier has no ulterior motive, just excellent wine with food to match. As well as premium wines, Atelier’s cocktails are off the charts! Make sip happen with a Lilywhacker with Hennessy, Antica Formula, and top the night off with Moreton Bay bug raviole. Fancy fresh. It’s getting hot in here! Beirne Lane is rocking around the clock, being Fortitude Valley’s newest bar and eatery open 24/7. The menu includes an extensive list of bar snacks, a raw bar, substantial Josper grill items, sides, and dessert. You can also tuck in to wine, craft beer, and even craftier cocktails. We’re never clocking out. Opa, and oh-la-la. Nostimo’s pork belly baklava will have a million words of praise exiting your mouth to room for more freakin’ baklava. This sweet and savoury hybrid will blow your mind with layers of tender pork belly between fresh, handmade filo pastry sheets. Salivating? Only a lot. La Lune is adding some flair to their limited $19 November pairing. $19 will be your ticket to either a glass of red with kangaroo carpaccio, or a glass of white with crudo. It would be rude-o not to. If you like piña coladas and getting caught in dessert, this is the one for you. Vintaged Bar and Grill has a summer lovin’ dessert mixing the likes of coconut ice cream coated with dark chocolate, roast pineapple, spiced rum syrup and poached cherries, in one unforgettable bowl. Eat up. - the gourmand who heavily identifies with The Grinch. Don't be a chicken, take a swing at Victoria Park! Brisbane’s finally jumping on the late-night dining train, and we’re more than here for it. The Garden Pantry is planting its roots in West End! West Village is whipping out their green thumbs with a new addition that’s hot and fresh out the kitchen.